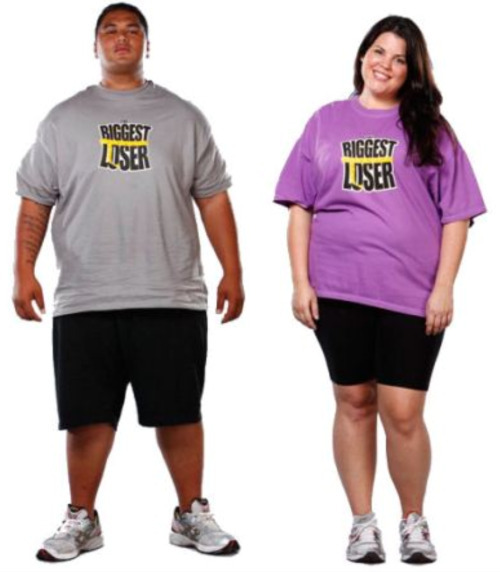 On NBC’s “The Biggest Loser” last night, yet another alliance was about to be broken up. More on that in a minute…but first, it was makeover week, and that prompted each of the six remaining contestants to hoot and holler like crazy, especially big Michael. They each had $1000 to spend on clothes and had a limo pick them up, with some dude from a show on Bravo called “Shear Genius” making them over. And he did a great job, actually. Last night on NBC’s “The Biggest Loser,” it hit me. There were 8 contestants remaining, and this season is dragging on like no other season before. It feels like we’re all trudging through the mud. But there was an interesting twist again. The show began with host Alison Sweeney offering up a temptation challenge. For this one day, the kitchen was closed and the contestants had to eat in this one room where there was healthy food as well as really unhealthy food. Whoever consumed the most calories this day would have the only vote at the weigh in, assuming that person didn’t fall below the yellow line. If they did, the voting would be like it normally is. Last night’s episode of “The Biggest Loser” showed the workings of karma, but not the way you would think. It started out with Alison Sweeney giving the contestants a pop challenge, in which they had to balance a tray of quarters with one hand, and for each quarter they would get 10 bucks. The person still holding their tray won that amount of quarters times 10. They all showed that it was much harder than it looked, and after a grueling 45 minutes, Michael won the challenge and with 100 quarters won $1000. Total cereal, the sponsor, doubled that money and also gave runner-up Sunshine $650 for having 65 quarters on the tray. Then CNBC’s Suze Orman, a financial whiz, tutored the contestants on how financial health parallels physical health in many ways. She said how she predicted Danny to win last season and that this season she was predicting Sunshine to win. Then Danny made an appearance and worked out with everyone, and he looks great still! Last night’s episode of “The Biggest Loser” was like a slap in the face to the show’s producers, who clearly wanted Melissa in this thing for the long haul but, well, you’ll have to read on….. Host Alison Sweeney threw another curve ball at the contestants to start the show, when she told them that one of them could literally earn immunity with the push of a button this week. She gave them each a tag to wear around their neck with the amount of weight they had to lose in order to reach 2% of their body weight. If someone felt they had reached that mark at any point during the week, they could hit a red button that sounded a loud and giant alarm. That player would weigh in and if they reached their 2%, they were immune from elimination. If not, they were out of this particular challenge, and someone else could try and gain immunity.